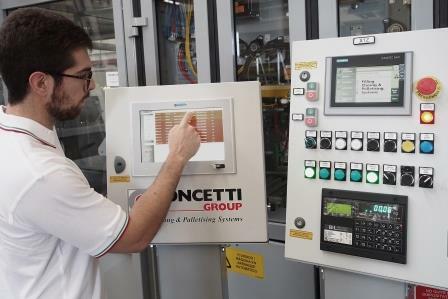 Improving productivity by monitoring the complete system in a facility will be easier in future, thanks to a new software solution that Concetti - a provider of weighing, bagging and palletizing systems - has implemented on one of its FFS Continua machine for the chemical industry. This solution, for a smarter “Industry 4.0” factory, offers management the possibility to supervise and review historical data by checking the production trends and performance of the bagging machine. This powerful solution is helping to reduce plant shutdown times and increase competitiveness by reducing costs. The software can acquire data from several Concetti machines, providing a complete view of the production system over time and uses analysis tools to make the process more efficient. It is a pc panel with a touchscreen interface that combines user-friendliness and the ability to track and display data collected by management in real-time.